Students at Westwood High School showed what they learned in photography class at Gallery Night Wednesday, Feb. 13, which highlighted Photoshop techniques and camera skills. Although each had listened to the same lecture from their teacher, Molly Barber and completed the same assignments, every display board was unique. Bradly Bolton said he had decided to think out of the box when given the “selfie” assignment. Therefore he wore a gas mask so he would not be recognized. The landscape photo Tommy Baker chose to display was taken at dawn from the edge of Highway 36. He stood on the roof of his mother’s car and aimed the camera lens at the mountains beyond the meadow, through which Goodrich Creek flows, to capture the orange and blue sky created as the sun began to rise. 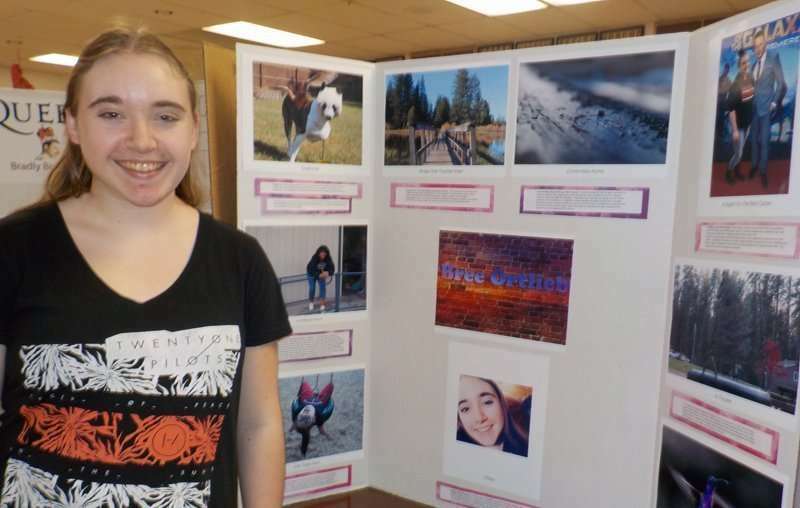 Haleigh Meeks explained that the photo boards featured nine projects. Three were Photoshop assignments completed during class time and six were photo assignments done off campus. The photo assignments were a selfie, a portrait, photo journalism, a landscape, a song title and a forced perspective photo which manipulates human visual perception, for example making objects appear larger or smaller than they are. Photoshop assignments varied with some choosing to display a photo in which their image was inserted. Bolton joined the rock band KISS on stage at a concert. He said he listens to the band all the time. Other assignments included use of watercolor behind an image; street art where an image was placed on a wall to look like graffiti; and mixed animal creations where different parts of animals were blended together to form a whole new species. The class is part of the career pathway educational opportunities offered to students at Westwood High School in the Career Technical Education program. Gallery Night wrapped up the first semester of the photography/film pathway. During the first semester the focus was photography and Photoshop. This spring the focus is film. The pathway classes give students the opportunity to explore different career options. In addition to visual and performing arts, there are courses in information technology, business and Ag mechanics. 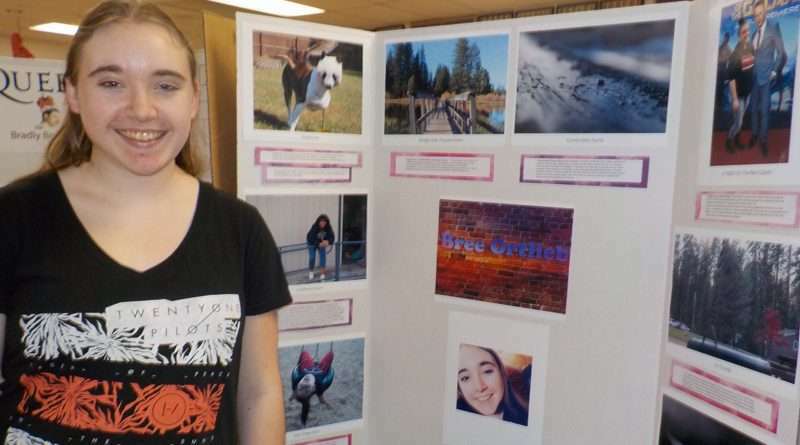 Bree Ortlieb, a high school junior, said her mother encouraged her to try the photography/ film pathway and last semester she fell in love with photography. At this point in time, she has not decided whether to choose a career path that includes the use of photography or Photoshop. The 2018-2019 school year launched the Career Technical Education program. Barber said students who are just starting high school would have more opportunities to gain real work skills they can use after graduation as they build on their knowledge year after year. For example, students who master Photoshop will be able to take a test and become certified. Whether the class leads to a career or simply provides a new perspective and understanding of an art form, it is proving beneficial. Meeks, a senior who will graduate at the end of this school year, said she signed up for the photography/film class because it was offered first period and she thought it would be a good way to begin the school day. She didn’t realize how much she would enjoy all that she is learning. “I really love this class,” said Meeks. Community members who attended Gallery Night voted for their favorite display. Barber said she would take the student with the most votes out to lunch.